If you are a qualified Freediving Instructor and would like to be included on the British Freediving Association website annual list of instructors, then we would like to hear from you!The BFA would like to provide a listing for individual instructors in addition to the club listings. If you would like to be included then please send an email to Liv at training@britishfreediving.org. Include up-to-date copies of your teaching insurance, HSE medical & a first aid certificate (First aid within the last 2 years), and we will list you up on the BFA website as a British Free Diving Instructor.If you send along any contacts such as a websites or email and what agency and instructor level you arethen this will be added to your details.This list will be renewed each yearand you will need to send your details to the training officer annually to be re-listed. The competition has reduced to one day for this year, and will be two disciplines over two sessions. Please visit the site www.freedivingcompetition.com to see more details and enter the competition. British Freediving Association saddened at the loss of Natalia Molchanova, Freediving’s most accomplished athlete in history. The British Freediving Association (BFA) is saddened by the news 23 times World Champion freediver Natalia Molchanova was reported missing after diving on Sunday August 2nd off the island of Formentera near Ibiza. Natalia was diving recreationally for fun with friends to depths of 30-40m without fins, a relatively shallow depth for someone of her accomplishments, when she failed to surface. Search efforts are ongoing but Natalia has yet to be found in a region known to have deep water currents. When Natalia was diving on Sunday, she was diving recreationally in the sea which is the same activity enjoyed by many recreational free divers and snorkelers in the ocean to much shallower depths. During training and competition, Natalia always dived on a line with a safety lanyard which is the system all trained freedivers use to avoid unnecessary dangers. Being attached to a line allows the divers safety freedivers to react immediately should a diver ever have any problem during a dive. Natalia was a great teacher of freediving as well as a great athlete and would have taught this system to her hundreds of students many times. The sport of freediving has strict safety protocols in place which are developed by the sports main organisation AIDA International www.aidainternational.org and used in competition. Safe diving practises are also taught to all students when they enrol on a course with a properly qualified freediving Instructor, making the sport a surprisingly safe pastime despite its media image as an extreme sport. Freedivers combine careful training, slow progression and a combination of athleticism and meditative techniques to allow them to make their dives. Natalia is much loved and respected within the International freediving community as a gracious Champion and exceptional person and her loss will be hard for the community to come to terms with. She has broken 41 World records and won 23 Gold medals in World Championships making her the most accomplished freediving athlete in history. The first female athlete to break the 100m barrier with a dive to 101m during the 2013 depth World Championships, she set yet another world record with a dive to 71m in the no fins discipline in May in Egypt at the age of 53. Natalia is the president of the Russian Freediving Federation and has developed many training programs for teaching freediving safely around the world. She is the author of scientific articles about freediving, and she has written poetry on the subject. She was known by her peers as being a remarkable athlete and intensely competitive, whilst remaining accessible to everyone, and always being generous with help and advice. Natalia had an intense love of the sea and the sport of Freediving, and devoted her life to doing the thing she loved. Our condolences go to Natalia’s son and training partner Alexey, and to all of her family and friends at this time. Thankfully tragedies such as this are rare in free diving, but never freedive alone and always seek training from a qualified instructor. Glass and Water is not a replacement for existing books on underwater photography as it focuses on freediving techniques, equipment and photo opportunities which are better suited to freediving (rather than scuba). ‘It’s most unlikely that you’ll come away without learning something brand new and innovative. I know that I did’: Martin Edge. In ‘Part 1: Equipment and Basics’ Mark shows how by choosing or adapting freediving and photographic equipment some early hurdles can be avoided. He also explains some underwater photography basics and opportunities for freedivers. ‘Part 2: Technique’ explains how using appropriate freediving techniques can increase the length of time available for taking photographs underwater and help to manage camera equipment. And in ‘Part 3: Perspectives’ Mark and a range of informed contributors reveal how to photograph particular animals and their personal approaches to freediving photography. This includes the author’s ‘Virtual Dive’ which pulls together everything covered in the book. The book includes photos and/or contributions from Fred Buyle, Sue Flood, Danny Kessler, Dr Anne-Marie Kitchen-Wheeler, Laura Storm, Andrew Sutton, and Shane Wasik. There is also a Foreword by multi-award-winning underwater photographer Dan Bolt and a Glossary of key terms. ‘Glass and Water should be as essential as a pair of fins and a camera for underwater photographers. Mark shares his tremendous expertiseÉ the methodical and well-illustrated techniques will benefit anyone wishing to produce great images in the sea’: Brian Skerry, National Geographic. Mark Harris is a former British champion freediver who has instructed, coached and judged at international level, consulted on and taught students how to freedive for roles in both television and film and ran London’s main club, London Freediving for almost a decade. Available now in paperback for £16.95 (ebook forthcoming) from Divedup.com, online and from retailers. Dean Chaouche wins silver medal at Suunto Vertical Blue, the Wimbledon of Freediving! Suunto Vertical Blue (VB2015), one of the most prestigious and much-anticipated freediving competitions took place at Dean’s Blue Hole on Long Island in the Bahamas between 27 April until 7 May. Attracting elite freedivers from around the globe, Vertical Blue has become known as the Wimbledon of Freediving. Three of the UK’s top Freediving athletes attended the competition: Georgina Miller, Tim Money and Dean Chaouche. The athletes had the opportunity to do nine dives in the three freediving depth disciplines, constant weight (CWT), constant no fins (CNF) and free immersion (FIM), in order to win the coveted championship title. Dean Chaouche, 25, a former electrician from Swansea, turned professional freediver, is a relative new comer on the competitive freediving scene. Quietly making his way up the ranks, he performed incredibly well, taking home a silver medal in the discipline of CNF, with an impressive dive to 68m and narrowly missing out on third place overall. We caught up with Dean and asked him to share his experience of the competition, what he learned and his plans for the future. Dean went from strength to strength in the other two disciplines, with an easy 91m CWT dive (a first personal best in a competition and he says his best dive, with more meters in the tank) and 80 FIM. The length of the competition can really test the athletes’ stamina. And as the competition goes on, unexpected obstacles can appear to challenge an athlete’s journey. The conditions, which had been perfect for the first three days, with no wind and amazing visibility, deteriorated when a cold front moved in. Before Dean’s 80 FIM dive, on day 6, he was very cold and close to not starting, but fellow athlete Georgina gave him her Gore-Tex jacket, which he says pretty much saved the dive. “If I could change anything to what I did in the competition, it would definitely have been how I approached the last third (act of the competition). I could have put some more depth on either CWT or FIM, which may have given me an overall finish. So next competition I will put the CNF dives in the beginning and I will make sure I can always dive on the last day. Find and follow Dean on Facebook and Instagram as Dean Freediver. Freedive-Earth is a brand new resource and community for freedivers worldwide. Our team is made up of experienced international athletes, instructors and a real life doctor. The site is packed full of training tips, freediving physiology, a no-holds barred Q&A zone, the latest in safety, news and information all with an emphasis on fun. 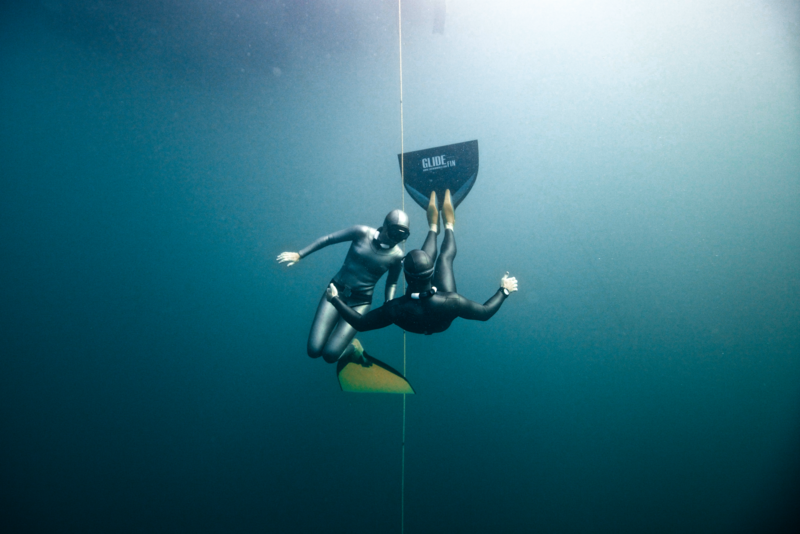 We’re proud to offer you the world’s first online freediving-specific training log, a comprehensive freediving school directory and the facility to connect with other freedivers around the world. Elios Sub (www.eliossub.com) was established in 1977 and prides itself on its continuous innovation, evolution, improvement and refinement of comfort in its suits. Elios have sponsored the British Team for a number of years and many British Freedivers wear their suits across the UK because of the quality and feel of materials used. We are extremely proud that Elios have offered sponsorship to our UK Team for this year’s World Championships. Prawno Apparel(www.prawnoapparel.co.uk) makes thoughtfully designed clothing for divers, freedivers and water sports enthusiasts. Underwater photographer Lia Barrett creates each design by pulling imagery directly from her underwater shots. Discreetly placed within each design are the location and depth at which the subject was photographed. The Freediver design used for the new BFA Team clothing features Caribbean reef sharks and Elisabeth Mattes, Austrian national freediver, both photographed off Roatan, Honduras, printed onto t-shirts and hoodies made from partially recycled fabrics. Beet-it (www.beet-it.com) uses 100% natural ingredients and the Beet-it Sport shot juice drink delivers a dose of 0.4g dietary nitrates per shot. The beetroot juice shots are now the preferred delivery method used by research teams to boost nitric oxide (NO) levels in the blood. Nutrition is extremely important to freedivers and we are excited to see how the Beet-it Sports range of drinks and bars, boost and prepare our bodies before an apnea session. Bounce Energy Balls (www.bouncefoods.com) are an amazingly convenient and are a tasty way to nourish your body, satisfy your hunger and sustain your energy. Bounce Energy Balls are a special combination of high quality proteins, carbohydrates, vitamins, minerals and essential fats. After a freediving session, recovery is of great importance and the Bounce Energy Balls have all the necessary ingredients to help our athletes do so. Tim thinks freediving makes the world go round, however his non-freediver friends refer to it as “hold your breath club”! He has been diving for a few years now and first represented the UK in 2006. Since then he has dived all over the place, and one of his favorites has to be Honaunau Bay, Hawaii. Imagine heading out for a dive, walking over the black lava rock beach, getting into the water with a turtle swimming in the coral reef, and then heading out to the deep past a few spinner dolphins to the dive line! He loves any events in freediving, and really enjoys the competitions as you spend a day, weekend or week in the pool, lake, sea or other country with loads of other people who are excited about the same stuff you are! Tim is very grateful to his employer, Saba Software (www.saba.com), for sponsoring him and enabling him to have the time to represent the UK in Sardinia. Mike is a 7 times National Record holder for team Great Britain, an SSI Freediving Instructor Trainer, and a former Royal Marine Commando. Mike has a strong background in teaching, as a freediver he is an SSI Instructor Trainer and an Apnea Total Master Instructor, but he is also a TDI Technical Diving Instructor and a PADI OW scuba instructor. He has a strong physical approach to his own training, however through Freediving he has discovered that equally important is the balance achieved through activities such as yoga and gaining greater self-awareness and mental focus. Both approaches feature strongly in his teaching style. Mike has dived to 102m in the Constant Weight with Fins (CWF) discipline, has set seven British National records, and is the current British record holder for CWT at 102m and for Free Immersion (FIM) at 96m. He was also a member of the British Freediving Team for the 2011 World Freediving Depth Championships. Mike lives in Indonesia, on the island of Gili Trawangan, where he teaches freediving courses and training (www.freedivegili.com). Adam is an Aida Instructor, Judge and Chairman of the British Freediving Association. He has represented the UK at the World Championships in Belgrade last year and has participated at other international freediving events. He greatly enjoys the recreational side of freediving, diving on shallow reefs and the simple pleasure of being in the water. Adam started freediving as a spearo in the Caribbean Island of Jamaica, where he discovered the beauty of the underwater world. After running a spearfishing school for a few years in the UK, he then decided to enter into and concentrate on the pure discipline of Freediving. Freediving changed his life, giving him the right input to discover and enjoy life in a whole new way, through the many amazing techniques and experiences. Adam runs a club called Blue Water Freediving (www.bluewater-freediving.co.uk). Jay has been freediving for many years and is currently training to be an instructor. He runs a club session in the City of Liverpool for Apneists UK (www.freedivingcompetition.com). Jay has always been drawn to the sea and freediving has simply allowed him to grasp what he loves about it. He enjoys the competitive side of Freediving and likes to see people come out of their ‘freediving shells’ and pull out big performances. He also relishes the camaraderie and support of his teammates and fellow competitors alike, there is in his opinion, no sport like it. This will be the second time Jay has represented the UK. He is a ‘pool rat’, ‘depth junkie’ and ‘spearo’ all in one. Jay works on the British Freediving Association committee, dedicating his time to supporting and promoting freediving in the UK. George has always been interested in the underwater world. She learned to scuba dive in 1998, and is a PADI MSDT instructor since 2005. She has been freediving since 2007 and is an SSI freediving instructor. George is a 5 times British National record holder, currently holding the women’s record of 06:27 in static apnea and competes for the UK; she has been part of the UK team since 2007. She has trained all over the world, including the famous Deans blue hole. George has a strong background in yoga and swimming and believes that mental focus and self-awareness is a crucial part of freediving, but most importantly it has to be fun. Above all freediving is a passion for her and a fantastic community to be a part of. She has recently set up a club called Aquacity Freediving (www.aquacityfreediving.com) along with her partner, photographer Daan Verhoeven. George has also been a committee member of the British Freediving Association as Clubs Officer since 2011, to help to share her love of the sport. Liv has represented Great Britain at 7 World Championships. In 2013 she won a bronze medal at the AIDA Individual depth World Championships in her favourite discipline Constant No Fins (CNF). In 2010 she was the World Absolute Freediving Champion with the highest combined international ranking and has been the UK Champion 7 times. This year she was awarded for outstanding contributions to British Freediving. Liv runs the UK’s longest running freediving club London Freediving (www.londonfreediving.org), as well as her own businesses in landscaping and in Freediving Teaching and Coaching (www.livphilip.com). She has body doubled for Halle Berry and taught numerous stars including TV personalities Ant & Dec. As Training and Safety Officer for the British Freediving Association, Liv helps to promote safer freediving in the UK. Based in London, she has collaborated on many arts projects and has recently completed her first soon to be released short film ‘A Place Below’. Liv says ‘over the years freediving has given me a great deal of pleasure and allowed me to meet some wonderful people. I look forward to this 2014 Great Britain Women’s Team pulling together to produce some really solid competitive performances at the Team World Championship in Sardinia in September’. Beci got into freediving after scuba diving in Thailand in 2012 and was blown away. She came back to the UK wanting to continue her underwater adventures but without all the heavy equipment and found a club in Richmond called London Freediving (www.londonfreediving.org) where she was introduced to an exciting yet tranquil, silent, underwater world, falling in love instantly. That same year she joined the UK Team to compete at the World Championships in Nice, France, her very first competition. Because of the support and encouragement of her fellow teammates and club, she has continued competing and playing under the water. This year Beci came third in the women at the pool National Championships, more commonly and affectionately referred to as the Great Northern (www.freedivingcompetition.com). Monday, 23 June 2014; — The BFA is very proud to announce this year’s Outstanding Contribution to Freediving award has been presented to Liv Philip (www.livphilip.com). This award was introduced some years ago year and in previous years, has been awarded to John Moorcroft and Ben Noble. As well as being National Champion seven years in a row, breaking ten national records, being the World’s top ranked female freediver across the six disciplines in 2010 winning the title World Absolute Freediver award and World Championship Bronze medal winner in the 2013 Individual Depth World Championship, Liv is one of the UK’s most active freedivers in our community. Liv, a Master Instructor who also runs two London-based clubs (www.londonfreediving.org), she has instructed and coached quite a number of other successful freedivers including many of the British Team showing a community spirit that makes her a great ambassador for freediving. Liv has represented the sport of freediving in the media many times with film and TV work, and works extremely hard in her role as Training and Safety Officer for the BFA.